One of my all time favourite counting-down rhyming songs, Five Little Speckled Frogs, is now a board book. 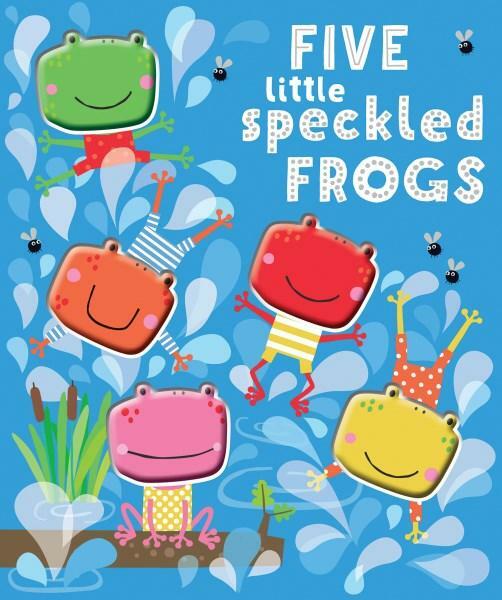 This version of Five Little Speckled Frogs is different from the original rhyme. The words have been changed making it less repetitious. Each page has a different rhyme that will expand a child's vocabulary. 'Four little speckled frogs sit on their speckled logs dipping their toes into the pond. The Five Little Speckled Frogs board book gives families the chance to talk about colours and counting-down from five to one with their children eg. The green frog wears what coloured swimming suit? The illustrations included other animals that live in and around a pond environment, such as fish and flies. Maybe encourage your young readers to find the animals and help them practice counting these animals too. The book is bright and sturdy, with soft squishy plastic frog heads that pop out of holes in the pages. Have a fabulous time counting the speckled frogs, ribbit-ribbit.